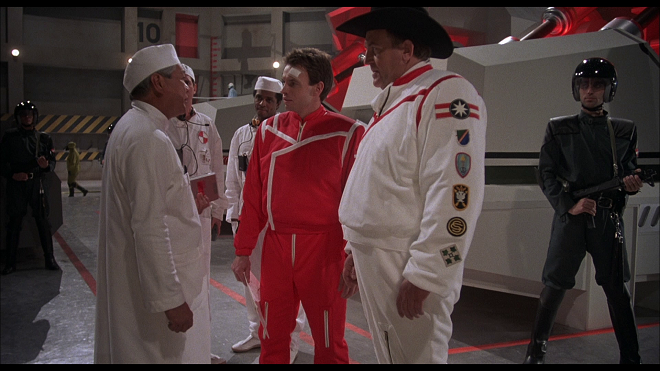 Directed by Stuart Gordon (Re-Animator), Robot Jox reveals a world where nations settle their territorial disputes by a single combat between two giant machines. Piloted by national heroes Achilles (Gary Graham, TV's Alien Nation) and Alexander (Paul Koslo, Shadowchaser), the robots meet in Death Valley to fight for the greatest prize of all: Alaska. But when Achilles' machine crushes 300 spectators, the match ends in a draw. Refusing to face Alexander in a rematch, Achilles is replaced by Athena (Anne-Marie Johnson, TV's Melrose Place), a genetically-engineered combat fighter. So when the GenJox is nearly killed and the game is forfeited, Achilles avenges their honor by challenging Alexander to a winner-take-all death match, in this heavy-metal, sci-fi adventure. Before the worldwide development of Jaegers to defeat interdimensional monsters from Japan; prior to Wolverine’s involvement with oversized Rock ’Em Sock ’Em Robots; and preceding Michael Bay’s assault on our senses with intergalactic toys which caused more property damage than a DC Comics superhero, there was ‘Robot Jox' from Empire Pictures (makers of 'Ghoulies' and 'Troll' as well as other beloved trashy films). It's a fluffy but ambitious piece of early 90s American escapist entertainment which re-introduced Godzilla-sized, hand-to-hand combat to the big screen. The movie is set in a post-apocalyptic future, where old technology like cathode ray tubes, oversized landline telephones, and other ancient technology still co-exist amongst robots the size of apartment buildings. These machines were created as an alternative to war between the Russian-based Confederation, and the more American-influenced Market. At stake are territories which are being claimed like Monopoly properties. Here, Alaska is up for grabs, and the confrontation becomes personal between pilots Alexander (Paul Koslo, who often resembles John C. Riley when in his battle helmet) of the Confederation and our local hero Achilles (played by Gary Graham). These guys are also known as ‘robo jox’ (according to the supplementary interviews, the name of the movie was changed to ‘Robot Jox’ after copyright threats by the makers of ‘Robocop’). Ann-Marie Johnson (‘Heat of the Night’ and ‘Hollywood Shuffle’) plays the only female of many test-tube-bred humans ("tubies" ) who have been genetically engineered to become fellow pilots. The jox operate their machines inside the robot, controlling their limbs like puppets with high tech weaponry and good old fisticuffs. ‘Robot Jox’ begins with the literally crushing defeat of a Market fighter known as Hercules by egomaniac Alexander. Achilles, one of the best jox around, is up next to take on the mad Russian in a desert-based match full of spectators. Unfortunately, Achilles ends up toppling his war machine onto a stadium full of hundreds of people after intercepting a projectile fist heading towards the crowd. These things happen. Though he is pardoned for the incident and a rematch is in order, Achilles decides to retire from any further fighting, giving Athena the opportunity to get her shot at Alexander. After hearing about her shot at the “title,” Achilles decides to return back into battle. She and our favorite son exchange more than a few words and punches, leading to a struggle over who gets to fight Alexander. What happens next may be a surprise to those who have never seen a movie about competing good-guys before. 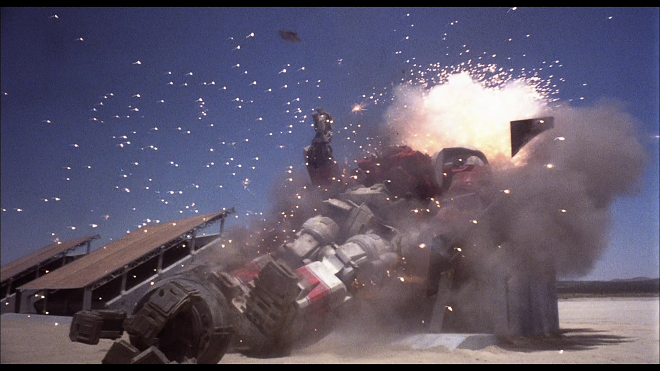 But in the end, a final battle does ensue which takes up the better part of the last third of the film. And yes, there is a scene in which Achilles does suffer damage to his lower extremity, consistent with the mythology. All this filler might have been intriguing if it weren’t so predictable. The film itself would be more interesting if there were more big battles to dazzle us. As if to make up for long stretches of talk, talk, and more talk, a few energetic set-pieces take place for our amusement, including a pretty good scene where competing robo jox candidates scale a trap-ridden jungle gym to as part of their competition, and a few not-too-bad moments involving combat training. 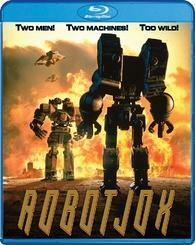 Overall, ‘Robot Jox’ delivers our daily recommended allowance of entertainment goods when it comes to "B" movies. Director Steven Gordon admits in his interview that the inspiration for his efforts came from Transformers toys as well as Japan’s animated series known as ‘Macross.’ Certainly, giant monsters and robots in combat have been around since miniatures were invented, and they’ve been entertaining audiences for just as long. The colorful costumes and antiseptic production design remind me of Paul Verhooven’s ‘Total Recall’ and at a glance, look similarly budgeted. The acting is generally over-the-top, especially Michael Alldredge as Tex, who seems more like a Simpsons caricature than anything else. Ann-Marie Johnson’s acting ranges from amateurish to overwrought, but she has an obvious onscreen appeal and looks like she’s having fun. Gary Graham and Paul Koslo similarly assume their roles with energy and vigor, which make the final resolution of their conflict less corny than it truly is. Needless to say, primary interest in 'Robot Jox' focused on a purely technical level, where appreciation of the filmmakers’ craft is highlighted by the excellent supplementary materials. By now, there probably isn’t a being alive who hasn’t been exposed to any one of Michael Bay’s Transformer epics, especially since they get longer, busier and noisier with each sequel. 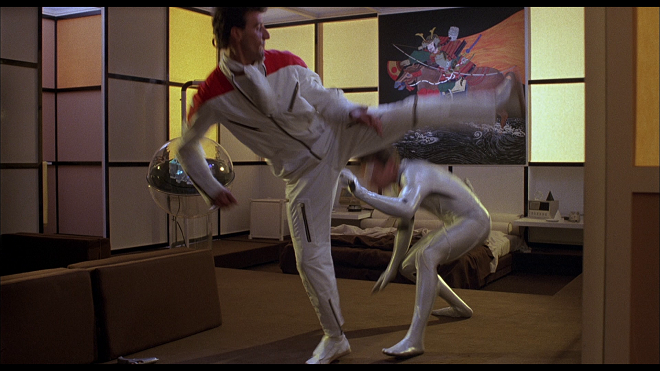 Based on that probability alone, watching the action in ‘Robot Jox’ is bound to be less epic and less convincing. Yet, one can truly marvel at how the effects were pulled off in the first place, especially when you factor in lthe ess than generous budget and the infant stages of CGI technology. (Of course, ‘Terminator 2’ would be released a year later and set a new standard for digital effects.) Quite frankly, I think some of the scenes in ‘Robot Jox’ compare as favorably as similar moments in ‘Pacific Rim’ when it comes to maintaining the fantasy illusion, and are just as entertaining. (At the very least, this movie clearly is more creative and more entertaining than anything ever hacked out by The Asylum and their cynically produced line-up of crap.) I didn't adore 'Robot Jox' but I'm glad to have finally seen it. ‘Robot Jox’ comes on a single platter BD50 from Shout Factory It is contained in a standard Blu-ray keepcase with a reversible cover printed with different artwork on the front and the back, though the text remains the same. The disc opens up with a Shout Factory logo and then defaults to an animated menu. There is no insert or booklet. Uniforms stand out with clean, crisp whites and bright reds, while the robots themselves look appropriately weather beaten and battle-worn on their dusty, metallic exteriors. The transfer reveals details and foreign elements which were better off obscured by lower resolution. For examples, wires holding up hovering robots and flying fists show up with enough clarity to be noticed by even the most untrained eye. There is also a scene in which a fight between Achilles and Athena reveal Ann-Marie Johnson’s stunt double as some brawny white guy. It’s also easier to tell the difference between film stock and lighting conditions when it comes to outdoor special effects. All three audio tracks are presented in DTS High Definition Master Audio 2.0, with enough bass presence to give your subwoofer a very modest workout. There is solid low-end reproduction with robotic footsteps, and general rumbling whenever heavy machinery is onscreen. Both the dialogue and the interviews come through distinctly and with considerable clarity. On the original soundtrack, the stereo imaging is fine, with some notable channel separation and respectable dynamics when it comes to sound effects. There is also good integration with voices and the music score as composed by Frederic Tralgorn. When it comes to pleasing their fans, Shout Factory really does an impressive job of delivering exceptional goodies for a film with an obscure cult following. With the exception of the interview with Paul Koslo and the photo galleries, each featurette is a high definition mastering of a standard definition source, and presented in 4:3 ratio. A Look Back at ‘Robot Jox’ with Paul Koslo (HD 10:14 mins) – This is an affectionate and enthusiastic look back at the actors, the production and release of the movie by the actor who played the main villain. Footage of the film accompany his verbal recollections for a short, but satisfying review of a film which barely made it to the theaters. Director Stuart Gordon (7:27 mins) – The director of acclaimed horror films like ‘Re-Animator’ comes off as humble and likable, as he discusses the origins of the film, his influences, and the general production. While the interview is short, his commentary on the film offers more detail and insight. Each technician speaks fondly of their work on the film, and their relationship with Visual Effects Director David Allen, who died in 1999. (Mr. Viskocil himself passed away in 2014.) Each of their anecdotes are fun and entertaining, and their respect and tribute paid toward to Mr. Allen is likewise genuine. There are no precise dates given as to when these interviews took place, but my guess would be somewhere in the early 2000’s. The interviews are refreshingly free of all the typically lifeless and rehearsed discussions contrived in Electronic Press Kits. 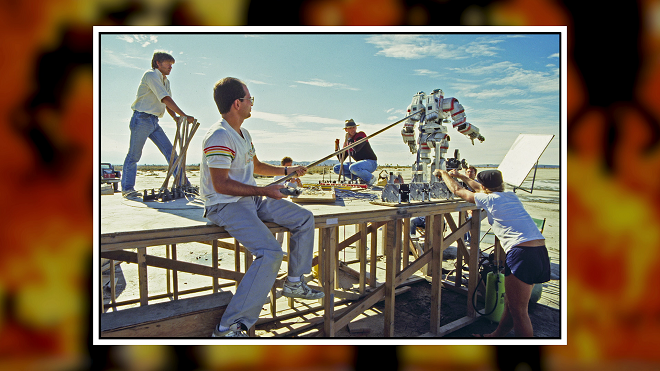 The behind-the-scenes information is full of well-explained details regarding certain effects and stunts, without getting bogged down by esoteric technicalities. Trailer (1:25 mins) - This footage is presented in high definition widescreen from an unrestored source. TV Spot (:31 mins) - Displayed in 4:3, this standard definition trailer (transferred to high definition) is basically a shortened version of the trailer. Behind the Scenes Footage (14:16) – This segment contains compiled video clips on the making of the movie, with the crew appearing on location. The focus is on the special effects, especially the model work. Much of the footage appears in rather rough (but still watchable) shape and is filled with artifacts associated with standard definition video. There is no narration other than the voices of the technicians who appear on camera. Those expecting to see segments involving the actors on the set or in rehearsals won’t find that kind of information here (or anywhere else on the disc for that matter). The audio extras include Two All-New Audio Commentaries, the first by director Stuart Gordon who is prompted and interviewed by Michael Felger, a DVD producer and filmmaker. The second commentary is by Paul Jentry, the Visual Effects Director of Photography and Associate Effects Director along Mark Rutherford, a Mechanical Supervisor and a Puppeteer on the production, and Paul Jesel the Stop-Motion Animator. Their discussion is lively and chock full of facts, stories and analysis. Given the occasional naughty language which creeps up from time to time, and the non-cartoony violence which appears here and there (a character takes a bullet to the head, people are shown pinned by giant pieces of steel, and a spot of blood which appears on a seemingly permanent bandage on Achilles’s forehead), it’s hard to believe that this movie was meant to appeal to young kids. And yet, the pedestrian storyline and shallow characterization would certainly draw yawns or laughter from adults. (It did from my friend, who is still a big kid at heart.) I can only assume that the main audience for this Blu-ray release will be for males in their thirties and forties who managed to catch this movie on VHS or cable TV and want to recapture a piece of nostalgia, or fulfill some curiosity. For that limited reason, I can half-heartedly give it a soft recommendation.